A nice and simple vegetable side dish that can be served with a rice, roast potatoes and even with a plain pasta like aglio e oil. 1. 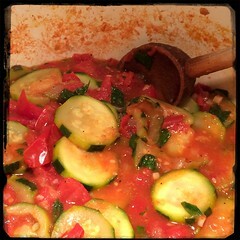 On medium-high, Pre-heat 3 tablespoons of olive oil in a sauce pot or small dutch oven. Add onions and when they begin to turn a bit translucent, add the diced garlic and Peperoncino Fiocchi (hot pepper flakes) (optional).